Definition: The Marketing Communication refers to the means adopted by the companies to convey messages about the products and the brands they sell, either directly or indirectly to the customers with the intention to persuade them to purchase. In other words, the different medium that company adopts to exchange the information about their goods and services to the customers is termed as Marketing Communication. The marketer uses the tools of marketing communication to create the brand awareness among the potential customers, which means some image of the brand gets created in their minds that help them to make the purchase decision. Why shall the product be used? When can the product be used? Marketing communication includes Advertising, Sales Promotion, Events and Experiences (sponsorship), Public Relations and Publicity, Direct Marketing, Interactive Marketing, Word-of-Mouth Marketing, Personal Selling. These tools of communication are collectively called as Marketing Communication Mix. Advertising: It is an indirect, paid method used by the firms to inform the customers about their goods and services via television, radio, print media, online websites etcAdvertising is one of the most widely used methods of communication mix wherein the complete information about the firm’s product and services can be communicated easily with the huge target audience coverage. Sales Promotion: The sales promotion includes the several short-term incentives to persuade the customers to initiate the purchase of the goods and services. This promotion technique not only helps in retaining the existing customers but also attract the new ones with the additional benefits.Rebates, discounts, paybacks, Buy- one –get- one free scheme, coupons, etc. are some of the sales promotion tools. Events and Experiences: Several companies sponsor the events such as sports, entertainment, nonprofit or community events with the intention to reinforce their brand in the minds of the customers and create a long term association with them. The name of the firm sponsoring the event can be seen on the playground boundaries, player’s jerseys, trophies, awards in the entertainment shows, hoardings on stage, etc. Public Relations and Publicity: The companies perform several social activities with a view to creating their positive brand image in the market. The activities that companies are undertaking such as, constructing the public conveniences, donating some portion of their purchase to the child education, organizing the blood donation camps, planting trees, etc. are some of the common moves of enhancing the Public Relations. Direct Marketing: With the intent of technology, the companies make use of emails, fax, mobile phones, to communicate directly with the prospective customers without involving any third party in between. Interactive Marketing: Interactive Marketing has recently gained popularity as a marketing communication tool, wherein the customers can interact with the firms online and can get their queries resolved online. Amazon is one of the best examples of interactive marketing wherein the customers make their choice and can see what they have chosen or ordered in the recent past. Also, Several websites offer the platform to the customers wherein they ask questions and get the answers online such as answer.com. Word-of- Mouth Marketing: It is one of the most widely practiced method of communication tool wherein customer share their experiences with their peers and friends about the goods and services they bought recently.This method is very crucial for the firms because the image of the brand depends on what customer feels about the brand and what message he convey to others. Personal Selling: This is the traditional method of marketing communication wherein the salesmen approach the prospective customers directly and inform them about the goods and services they are dealing in. It is considered as one of the most reliable modes of communication because it is done directly either orally, i.e., face to face or in writing via emails or text messages. 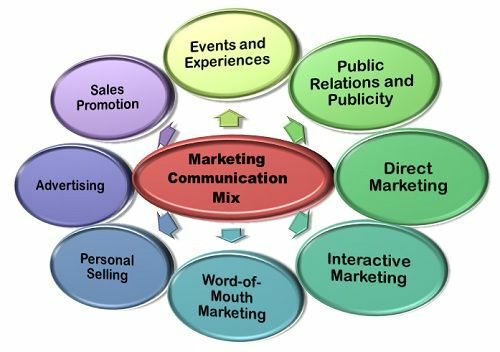 Thus, marketing Communication mix refers to the different tools that a firm can adopt to inform, persuade, and remind the customer about the product and services it sells. seyi which university are u pursuing the course? Very Nice Post! This post is sharing such a valuable information. This content was really helpful and easily understandable this helped me a lot.